Tone – inner frequency, the architectural information concerning the potential cognitive gifts for the unique life. Color – exit frequency, messenger of tonal information that gets captured by MM. Magnetic Monopole captures the exit frequencies of design and personality color to create the holistic body-mind life. The MM captures a transferred color without the message of tone (unique cognitive gifts) when the decision making is not aligned to the form. The CHAIN of possibilities from 5 bases, 6 tones and 6 colors, brings specific nuance to surface line. 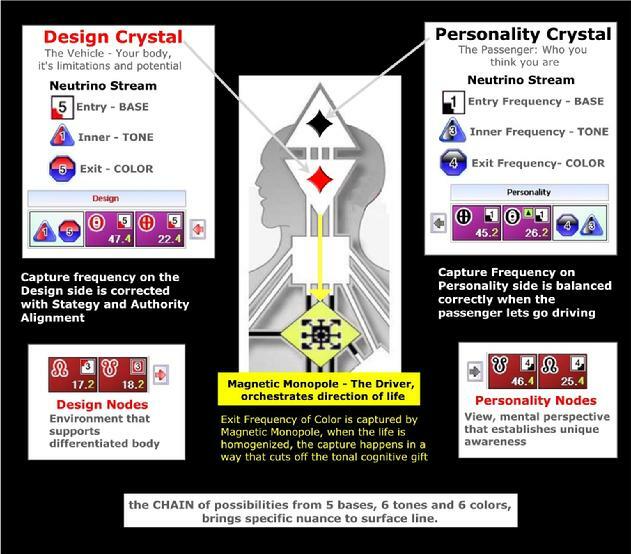 There are two dark matter crystals that filter the neutrino stream: one for the body intelligence (design) and the other for personality mind. The exit frequency (called color) of the neutrino stream as it passes through these crystals is captured by the Magnetic Monopole and the illusion of separation as a of body and mind consciousness (atomic in nature) is created. When ‘mind over matter’ not-self thinking rules the life, the Magnetic Monopole captures what is called the transferred color. That means the information of the inner frequency carrying the true cogntive gifts (tone) for the unique consciousness does not get transmitted by the color. The result is a very topsy turvy world where value sructures are dominated by thinking that is not grounded in real perception. Decision making from strategy and authority involves surrendering to the form principle. That allows for the MM to capture the correct color frequency from the design crystal. On the personality side it is more tricky because of the nature of duality. The conditioning to use the mind to run the life developed the habit of familiarity and attachment to the transferred color quality. Developing awareness of the dualistic polarity between the qualtiy of the true color and transferred color (using the knowledge color transference mechancs) allows for that habit to be seen for what it is. It is the seeing without interfering that accesses the passenger consciousness that frees the mind of the preference. Then the mechanism of the mind will naturally find a balance, where there is a resting in the color carrying the underlying cognition with occasional movement to the transferred color just for reference. The Four Transformations information is generally the entry point for advanced information sessions. However there are two other major categories of Human Design knowledge that can be worked with either interspersed with the Four Transformations advanced work or separately. Variable knowledge is independent of the mechanics of ‘type’, it concerns understanding the cognitive differentiation that emerges by looking at what is called the ‘rightness or leftness’ and how it configures in the ‘being and seeing’ of a chart. There is surface chart – the holistic illusion of body and mind, orchestrated by the Magnetic Monopole. There is substructure information for what is below the line in each cognitive area – the Four Transformations. <?xml:namespace prefix = o ns = "urn:schemas-microsoft-com:office:office" />BEING – The Sun Earth information on both the Personality and Design side. This is also known as the ‘DEPENDENT VARIABLE’. It concerns the brain and the conceptualizing style of the mind. SEEING – The nodal information concerns how we are designed to meet the world. It is sometimes called ‘the street where you live’ or our ‘trajectory’. The unfolding of our lives involves being attuned to very specific dimensions. (one of 32 variations of nodal polarity). Our bodies and personalities contend with different frequencies. This is known as the ‘INDEPENDENT VARIABLE’, because the nodes are about our life journey, how we end up thinking is dependent on this ‘reality’. The Being and Seeing (also known as the ‘cross of life”) both operate on the Design side and the Personality side. RIGHTNESS and LEFTNESS – since the evolutionary shift in 1781, we have picked up new cognitive abilities that previously were not part of our ability to take in the world. There is now a mix of ‘old’ and ‘new’ in the genetic distribution in the total population. Left does not mean left side of the brain, it means is part of the inherited capacity from our 7 centered ancestors. Leftness is connected with tones 1,2 & 3, Rightness is connected with tones 4,5 & 6. Then there is a new way of functioning called: PASSIVE RECEPTIVE cognition – or right (abbreviated to ‘R) relates to a cognitive approach to the world, that is not survival oriented. Instead it is as a resource reservoir that can be accessed only by request from outside, it cannot be pro-actively offered. VARIABLE GROUPING – is a summation of how the rightness and leftness configure in the four areas of being and seeing. STORY <?xml:namespace prefix = st1 ns = "urn:schemas-microsoft-com:office:smarttags" />LINE - concerns the Design South node and the Personality North node. It is information about the trajectory of the nodes that your life experience is designed to unfold with. LINK NODES – concerns the Personality South node and the Design North node. It is information for how the Design body consciousness and the Personality mental consciousness are linked so that the life has coherence as a joint venture. This leads to fascinating indicators around the tendency to ‘go to sleep’ about developing consciousness or feel wound up that something is missing in the development of consciousness. that can be seen from the resonance of the planets and the Being/Seeing information. 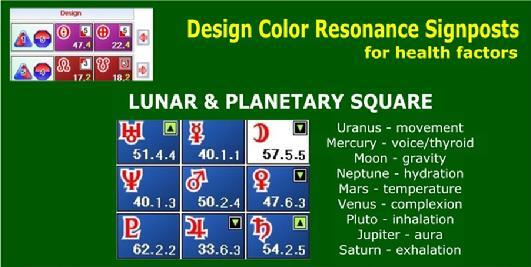 Personality Resonance Mapping gives signposts for how the mind will process input and can be also be seen from the resonance of the planets with the Being/Seeing information. The difference on the personality side is that it connects to how the mind processes the nature of duality. The signposts can be used in the watching process that disentangles the ‘watched’ from the passenger ‘watcher’.